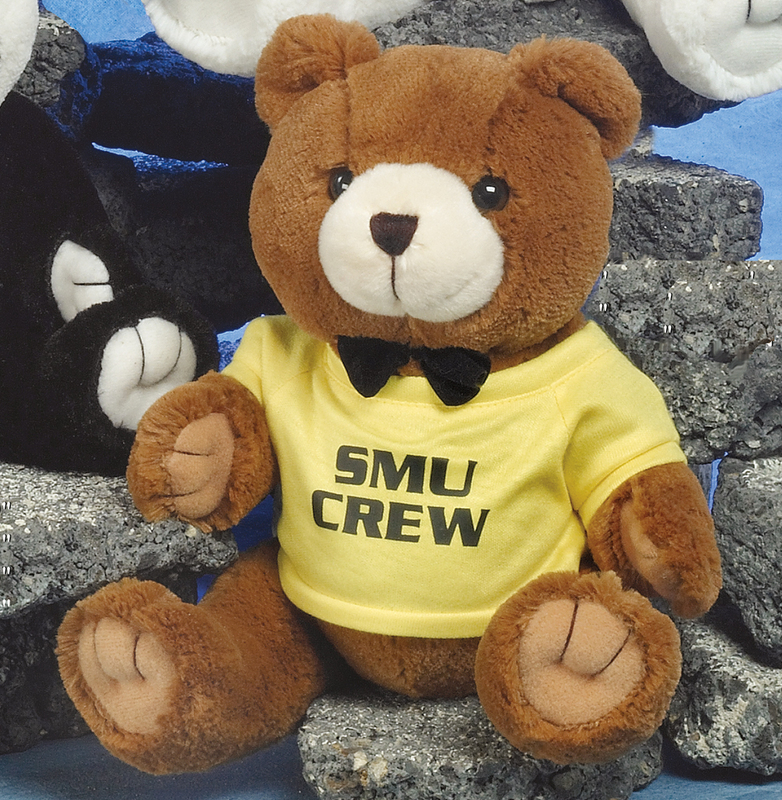 Thank you for visiting CustomBears.com. Pricing includes the t-shirt with a one-color imprint. 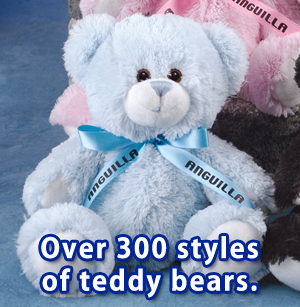 Search our 68 page catalog to see our large selection of teddy bears and stuffed animals (over 500 styles in stock). Choose from printed t-shirts, jackets or ribbon - Lead time is 14 days. 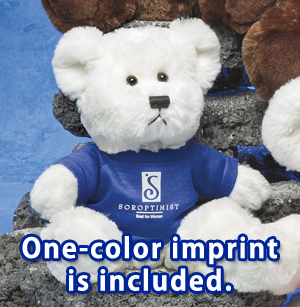 The teddy bears and accessories are in stock and we print the shirts or accessories as needed. You can mix-up the shirt colors as desired as long as the logo remains the same color. Shipping from New York. 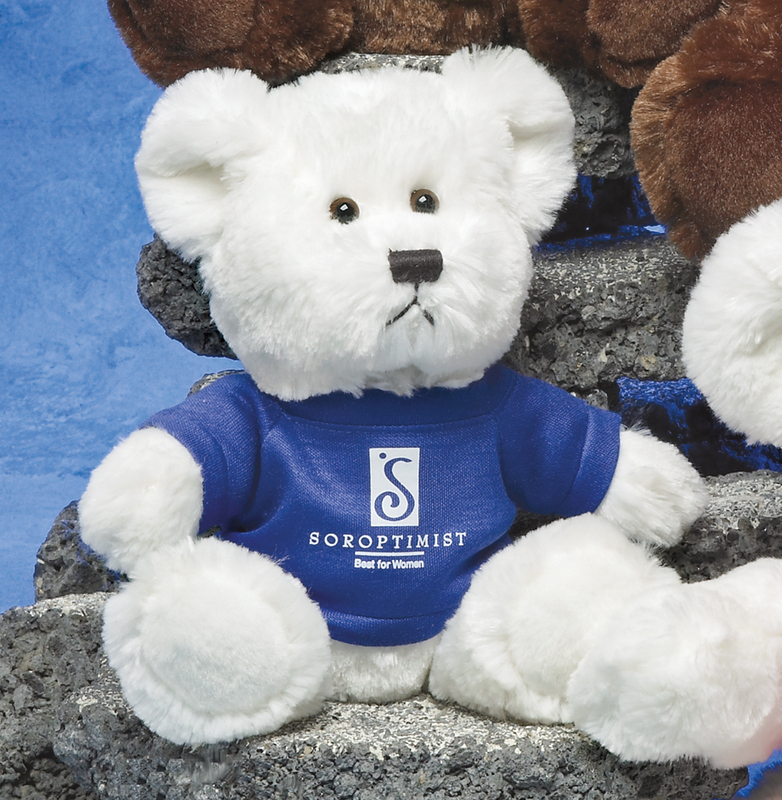 We offer a huge selection of teddy bears with bandanas and custom plush animals with t-shirts. In addition to printed t-shirts, we also offer printed jackets, printed ribbon and a large assortment of hats. Promotional accessories are available for various styles and size of stuffed animals. Match the size code for the accessory against the size code for the animal. The accessories will enhance the theme of your event by creating a visual presentation while simultaneously providing a lasting keepsake. We offer many shirt colors and accessories. Look at the bottom of each catalog page to determine the size code. 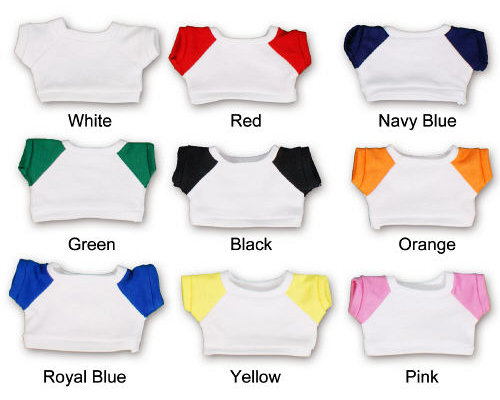 Shirt colors vary by size code. Our pricing includes a one-color logo (white, blue, red or black). We can only print multi-colored logos onto white backgrounds. We offer solid white shirts and white shirts with colored sleeves as shown below. Please email your high-resolution artwork. We operate in a PC environment. All artwork should be 300+ dpi. We accept most types of artwork files. Please visit the Artwork Guidelines Page to learn more about sending your artwork to our company. We can print logos, text or images onto the t-shirts. Naturally, the set-up charges vary based upon your artwork and colors. We will confirm the set-up charges after we have reviewed your artwork. Generally, the set-up charge for a one-color logo using a standard color is $25.00. The lead time for production is usually 14 working days after approval of your artwork. Delays can result from a variety of reasons. As long as you provide the correct artwork, the process should be smooth. Most orders are delayed due to incorrect artwork submission and improper formatting. For this reason, we ask that you send us your artwork for review. We ship using UPS ground delivery. We provide an estimate for the freight with every Sales Quotation. Please tell us the ZIP code for the delivery and also confirm whether the destination is residential or commercial. UPS charges higher rates for delivery to residential destinations. RUSH delivery is available. We also can ship by FedEx upon request. International orders are accepted. Please provide your delivery information. We will provide an estimate for the freight expense. The buyer is responsible for all import tax and related duties. Please contact us via email to discuss the payment terms and shipping process. When shipping to Canada, we prefer to use your UPS, Purolator or FedEx number. Copyright 2019 GIFTCO. All rights reserved. Sitemap.